Along with salt, black pepper is probably the most commonly and widely used culinary seasoning. The history of black pepper goes back to at least to the time of the Ancient Greeks and Egyptians, where it was regarded as a spice only afforded by the very rich, and used only in the most expensive dishes. Originating in South East Asia, it was a highly sought after trade product, much of it being grown in the Malabar region of South India. However black pepper is not the only form of pepper that we use in our cuisine. Let's have a look at the different types of pepper that are available. The pepper plant is a vine which produces bunches of single seeded fruit spikes, which are the fruit from which pepper is produced. How the fruit is handled determines which sort of pepper is produced. Unripe fruits are green, gradually changing to a dark red when fully ripe. Pepper gets its spicy heat mostly from the piperine compound, which is found both in the fruit and in the seed. This is a different substance from capsaicin, which is what gives chilli peppers their heat; piperine has about 1% of the heat of capsaicin. Black pepper is produced from the green unripe fruits of the pepper plant. The fruit berries are cooked briefly in hot water, both to clean them and to prepare them for drying. The fruit is dried in the sun, or by machine, for several days, during which the pepper around the seed shrinks and darkens into a thin, wrinkled black layer. Once dried, the spice is called black peppercorn. The flavour, or heat, of black pepper is generally regarded as being stronger than white pepper, and is usually the pepper of choice in most culinary recipes. 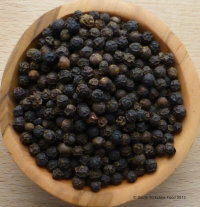 Black pepper was used in Indian cuisine to impart heat to dishes, long before the chilli became common place. A typical example of this is Rasam, Indian Pepper soup, which is a warming and delicious soup, that is still made today using the pepper based based spice mix. The Indian equivalent of the Jewish Chicken Soup! 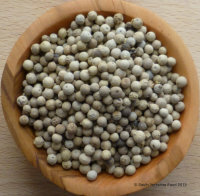 White pepper is the seed of the pepper plant alone, with the darker coloured skin of the pepper fruit removed. The fully ripe red pepper berries are soaked in water for about a week, during which the flesh of the pepper softens and rots. The fruit is then rubbed to remove the remaining flesh, and the single white seed is dried, and becomes white pepper. The taste, heat and odour of white pepper is often regarded as being different to black pepper, being milder in heat, but sometimes stronger in smell. It is used, usually, in light coloured dishes, such as cream sauces, where flecks of black pepper would spoil the appearance of the dish. Personally, I regularly use white pepper, as I like the flavour. 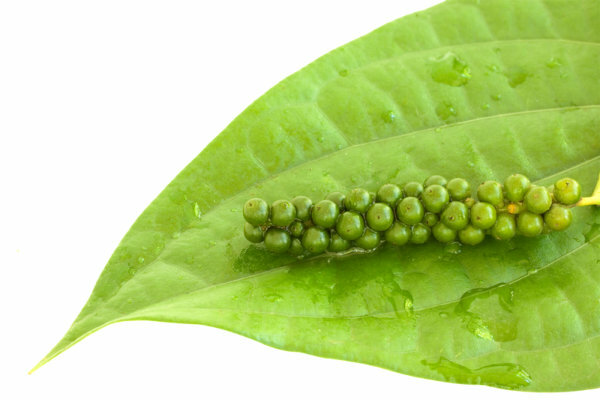 Green pepper is made from the unripe fruits. 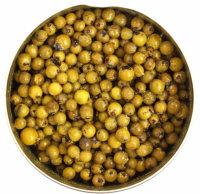 Dried green peppercorns are treated to retain the green colour, for example, canning or freeze-drying. 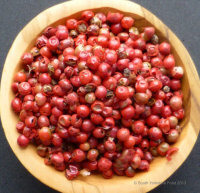 Pickled peppercorns, also green, are unripe fruits preserved in brine or vinegar. Fresh, unpreserved green fruits, which are largely unknown in the West, are used in some Asian cuisines, particularly Thai cooking. The flavour of fresh pepper fruits has been described as piquant, with a bright aroma. They decay quickly if not dried or preserved. Pink or Red pepper is not a true pepper , but comes from the seeds of the Peruvian Pepper tree. It does not have a particularly strong pepper flavour, and is used more for artistic presentation, when mixed with black and white peppers. Szechuan Pepper, is again, not related to true pepper. 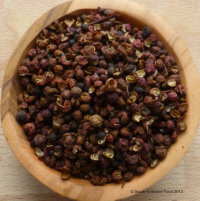 Szechuan pepper is widely used in Chinese cuisine, and has a unique aroma and flavour that is not hot or pungent like black, white or chilli peppers. Instead, it has slight lemony overtones and creates a tingly numbness in the mouth or on the tongue, similar to drinking a carbonated drink. It is also known as Chinese pepper, Japanese pepper, aniseed pepper, Nepal pepper, or Indonesian lemon pepper. 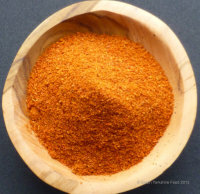 Cayenne pepper or, red pepper is the dried fruit of a hot chilli pepper. It is red coloured when ripened to maturity, but also eaten while still green. It is named after the city of Cayenne in French Guiana, it is related to bell peppers, jalapeños, paprika and others. The fruits are dried and ground, baked into cakes, and are then ground and sifted, to make the powdered spice. It is widely used in many cuisines, particularly lending itself to hot sauces and preserves that use vinegar. Please enter your email address so we can add you to our mailing list.